Earn $7.40 in VIP credit (740 points)What's This? 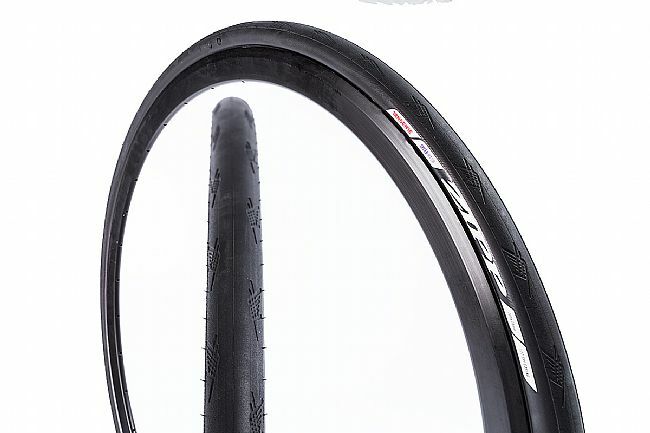 The Zipp Tangente RT25 and RT 2828 Clincher Tire takes the lessons that Zipp learned with their Tangente Speed R28 tire and added a tubeless casing to make this the ultimate race-ready tire. Measuring in at 25mm and 28mm wide respectively, Zipp set out to meet the needs of current cyclists who seek the lower rolling resistance and more comfort that a wider tire at lower volume provides. This race-ready tire combines the added grip of a larger contact patch with the reduced rolling resistance that comes with a larger casing to provide superior handling in both wet or dry conditions. Set of tires measuring 700 x 25mm and 700 x 28mm wide respectively..
292 grams (RT25) and 302 grams (RT28). I have questions about why tubeless tires need to be heavier then my former clincher and tube combinations. When you add 2 oz of sealant it gets even worse. However, I have have been running this tire on the front for a few weeks, without sealant. It is holding air pressure better then my Kenda with sealant on the back. Two rides ago I ran over large pieces of broken glass that shattered more under my tires. The rear Kenda did fine, possibly because of the sealant. The odd thing was that the front Zipp without sealant, came out perfectly and that was the tire that hit the most glass. That one still holds air better then the Kenda. Its before ride review, little advice for installation process. It goes on a rim pretty easy, 19mm inside 27mm outside VENN REV 35 TCC tubeless ready. Tires are pretty much impossible to set without compressor dont even bother with floor pump or CO2, need quick air supply. Let them spent day on whell first, use no sealant at first, add it after initial tire set up, this will save you lots of spills. Have fun and ride on. Tried these on my new TCR Advanced carbon tubeless rims, they just dont pair. These may mesh with Zipp tubeless but they dont fit the Giant rims. Went back to the Gavia tires and fit perfectly. Also no issues running Continental GP (with tubes) the Giant rims. Ive tried a lot of different tubeless tires with varying results. So far, after just a few hundred miles on these, the Zipps (25) seem a great combo of handling, forgiving ride, low rolling resistance and durability. One glass puncture on the rear so far but no tire would have prevented it and overall wear and puncture resistance seem good.